Preheat oven to 400℉. Toss sweet potatoes, onion, and salt and pepper in 1 ½ tablespoons of olive oil on a large sheet pan and roast for 20 minutes. While the sweet potato is roasting, empty ground pork into a large mixing bowl. Add fennel seeds, maple syrup, smoked paprika, red pepper flakes and a generous pinch of salt and pepper and mix well with a spatula or your hands. Add remaining olive oil to a large skillet and heat over medium. Add maple pork mixture to pan, and cook until thoroughly browned, leaving the pork in larger chunks. Stir in the roasted sweet potatoes and onions, along with the baby kale and fresh herbs. 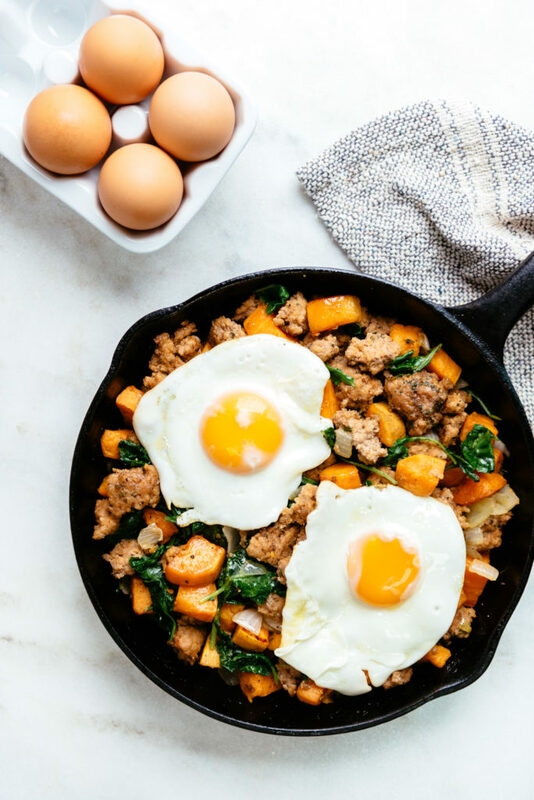 Serve sausage hash topped with an egg cooked to your liking!